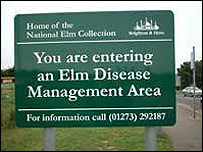 Since the 1970s the control of the disease in Brighton and Hove, has been based on a policy of sanitation essentially involving the removal of moribund Elms to prevent them becoming a source of breeding material for Elm Bark Beetles a major spread vector (Scolytid Beetles) . root interference or general decline are also susceptible to the intentions of breeding Beetles. Sanitation control is therefore highly dependant on the speedy detection of such trees regardless of reason. Trees affected for reasons other than Elm Disease are generally identified during routine Arboricultural inspections of Parks and Highway trees although the timing in carrying out required remedial work will not be as critical as with trees detected with Elm Disease during the main infection period. To ensure that such trees are identified with little delay, Brighton and Hove has for many years seen continuous inspection during the period as vital to its ability to control losses of its Elm stock. In support of this it has utilised all media outlets as they have become available to ‘educate’ the public about the problem, a welcome and helpful source of local information. Similarly it has trained Parks maintenance staff to identify symptoms in Parks and open spaces and has a great source of local ‘eyes’ with Street refuse operatives who have been issued with information sheets and who prove very effective in reported a range of tree related problems. The main routine and scheduled inspections rests with the City’s Arboriculturists and Arborists whose priority during the infectious period is to inspect all areas of the City. Finally, an experienced Elm Disease inspector is employed between June and September to inspect all known Elms in the City attending all sectors of the City on foot. This officer also has a major responsibility for liaising with owners of private properties where diseased Elms are identified. While the Local Authority has legislative powers to enter such property to carry out works and charge the owner accordingly. However, the process is lengthy and the imposition likely to cause unhelpful and serious issues between residents and the Local Authority. As well as imposing financial difficulties to some householders there was seen to be a major risk of infected Elm owners not reporting their tree due to the financial outlay facing them with the high possibility of trees becoming breeding stock for Elm Bark Beetles if undetected by other methods. In identifying and considering such issues the City has since the 1970s fully funded the costs of dealing with infected Elms situated in private gardens and this has remained a significant and important factor in the City’s success. infected Elm acting as a conduit for spore transfer from itself to adjoining Elms. A classic example of transfer would be with English Elm say in a hedgerow. As these do not produce viable seed they have a strong reliance on producing new trees from their roots and therefore many trees can be reproduced over a period all sharing an interlinked root system. As happened rapidly from the introduction of the virulent form of Ophiostoma novo-ulmi if one tree became inoculated with the fungus this would pass via the Xylem into the tree’s system and through the related root complex in o the next tree and then the next progressing, as indeed happened, through the whole hedgerow. This method of spread contributed to the loss of thousands of Elms altering the landscape of southern England dramatically. Similarly but distinctly different, Elms of differing species, varieties and cultivars have the ability to fuse their roots with neighbouring trees thus also allowing transmission from an infected tree into a healthy one without vector involvement . Such unions are likely caused by roots from separate trees rubbing together and effecting a union via cambium contact. The solution to these problem is the same and involves the physical severance of roots between interconnected trees. when allowed some years previously this was carried out by drilling a series of holes with a soil auger in a line between selected trees and filling these with a strong soil sterilant that killed off a band of root tissue effectively severing the union in a manner that did not involve major alteration to the surrounding ground, a boon in formal parks and private gardens. With such chemicals now banned or their use heavily legislated, this effective treatment has relied on a more intrusive method and involves physically trenching to cut or tear roots to effect separation. This is simply done where room allows, using the back arm of a JCB or similar vehicle fitted with a trenching bucket but the method still requires a positive assessment on where to position the trench to avoid severing the root system to a degree where the structural stability of the tree is adversely affected. Where room is very restricted it may be possible to access with a purpose built powered ditching machine which can create the desired effect with the minimum of disturbance. The latter fact also makes this option ideal where disruption to fine turf or formal gardens is required to be kept to a minimum. Following root severance operations it is necessary to ensure that visual inspections of the trees involved are carried out to ensure the efficacy of the treatment with reversion to felling required if the treatment has been unsuccessful. While the sight of an Elm with large areas of its foliage shrivelling with yellow and brown leaves abundant suggests felling is necessary, trees in such an advanced stage of infection need not exist in a control regime where frequent inspections are undertaken. Where trees are found with visual symptoms affecting around 10% of the overall canopy there is a real opportunity to carry out the removal of the infected limb only, pruning back to a point beyond the point of tylosis (a gummy dark material produced in response to the present of the fungus). This operation has seen many infected trees ‘saved’ from a certain death due to the high level of speedy detection by all involved.